If you want to be a great athlete, you have to have the right balance between playing and practicing your sport. However, few find this perfect balance and end up doing too much or too little. As a result, they get hurt or leave a lot of athletic potential on the table. Here is how you can find the perfect balance between your sport and lifting. While proper training can do wonders for improving your game, nothing is more important for improving sport performance than playing and practicing your sport. Heed this sage advice from the wise Coach Dan John. Some athletes don’t lift and this is a huge problem (you will finish your playing career far from your potential – that is if you finish and don’t have an injury finish you). Others try to be lifters. A lifter is someone who makes lifting as their top physical priority. This is great if your sport is powerlifting, weightlifting, strongman, crossfit or bodybuilding. However, if you play another sport, being a lifter wrecks you. When athletes become lifters, they lack the time and energy needed to be great at their sport. Remember that training for the lifter is like sport practice for the athlete. You can’t expect have the time or recovery ability to do both. Athletes who try to be lifters also fail to realize that these lifting sports are sports. 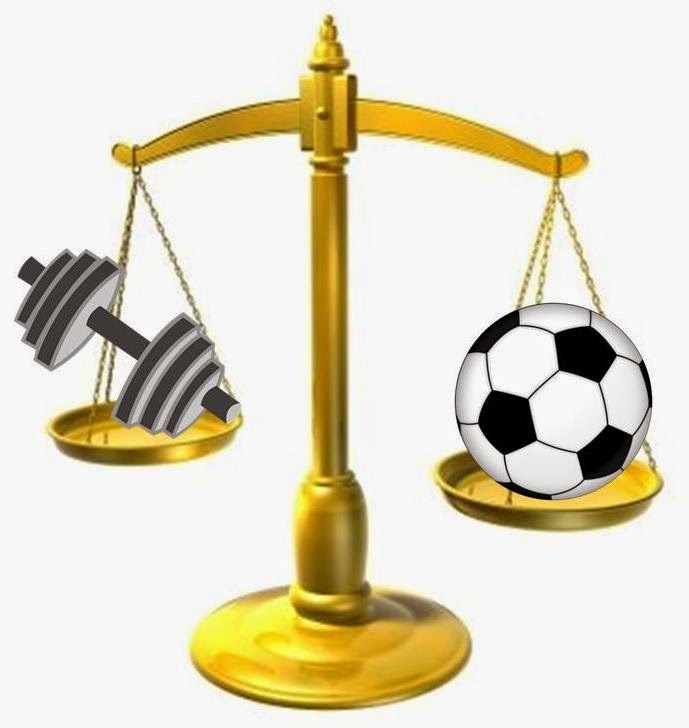 An athlete blindly following a program for a lifting sport is like a soccer player hoping that more time on the basketball court will improve his/her soccer game. Some athletes only train during the season when the coaches are carefully watching them. This causes you to miss out on the off-season when you have extra time and energy to make some serious gains. Others train hard in the off-season, but then stop when pre-season starts. This causes you to lose all your hard off-season work. The amount of training you do should be the opposite of sport. When your sport dies down, crank the training up. When you sport pick up, back down on your training. Don’t make the common mistakes of just training your upper body so your legs are fresh. While some upper body work is helpful, it alone is not exactly what you would call a game-changer. In mainstream fitness, soreness is how many people evaluate the effectiveness of their workouts. If you got really sore, it must have been an amazing workout. In the world of athletics, the effectiveness of your training is measured by injury stats and performance tests. In athletics, you want to avoid soreness – especially in-season. To do this, you want to avoid infrequent exposure for muscle groups and avoid changing exercises in-season. For example, if you only train your legs 1x per week, or you try to confuse your muscle by doing something different each time you will always be sore. For in-season programs, I tend to place the heavier work earlier in the week. If some hypertrophy work (at least in the lower body) is needed to maintain lean muscle mass, this would also be done earlier in the week. The second training session of the week would be (at least in the lower body) focused more on speed and power. Don’t make the mistake of trying to train after practice. After an intense, 2 hour practice, your glycogen levels are depleted and you are mentally and physically drained. Extending your physical activity by adding a training session at the end when your body is in a catabolic state (muscle breakdown) is counterproductive. It is also a great way to increase your risk of getting injured. The best time for athletes to train is earlier in the day. This allows you to prime your body for storing glycogen (note: follow up your training session with protein & carbs). Power and non-exhaustive strength training also allows you to potentiate your nervous system may even improve your performance. Mainstream fitness is about making people tired. Athletic training is about making people better. In mainstream fitness, people use light weight and then do tons of reps until they feel tired. During the in-season, many athletes want to lift light weights so they are not tired for practice or games. However, the light weights are a complete waste of time. Heavy, non-exhaustive strength training (e.g. 3 sets of 3 reps on a squat or deadlift) will improve your performance without making you tired. What most athletes know about training comes from mainstream fitness stuff – not high-performance training. As a result, they are tempted to add their favorite fitness extras such as crunches, cable cross-overs of jogging that always seem to be missing from high-performance training (note: this is not an accident!). These mainstream fitness favorites will not only fail to improve your athletic performance, they will actually detract from it. Also, simply adding them in will not deliver the aesthetic changes you want either. Training like an athlete and eat properly and you will play AND look better. Countless people around the world lift weights without trying to progressively increase weight. This is a complete waste of time. During the in-season, many athletes think they should just be maintaining. While it is true that the off-season is the time when you want to really make some serious gains, you can still make small improvements (especially in strength) during the in-season. Look to make small increases in weight or reps most weeks during the in-season. Unless you are at a very elite strength level, this is quite doable if you do not get greedy. Everyone is different. The key to personalizing your training programs is to be constantly monitoring. 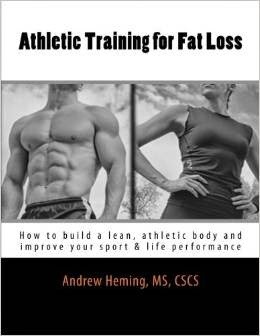 Keep an eye on your body composition, strength levels and performance indicators (e.g. vertical jump, 10 yard sprint). We also test grip strength as a way to monitor CNS (central nervous system) fatigue. If you are losing muscle, you will need to up the volume and your food intake a bit. If you are getting tired and weaker, you may need to decrease your training volume a little bit and improve your recovery (e.g. better nutrition, more sleep, etc.). Find this perfect balance between sports and lifting and enjoy winning games and dominating the competition!